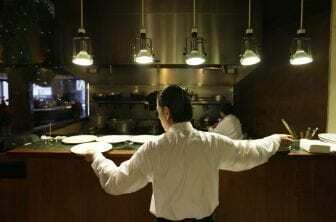 Nearly all restaurants in the United States operate under the tip system: Servers and those in the back of the house — chefs, line cooks, dishwashers, etc. — are paid a lower-than-average standard minimum wage, and then they earn tips to make up for the pay disparity. In the past few years, though, some restaurateurs have embraced a gratuity-free model. That includes Andrew Tarlow, the owner of several prominent restaurants in New York City. In 2015, he decided to shake things up, eliminating the tip altogether at three of his restaurants and raising his workers’ salaries, as well as the prices of menu items. “We were really trying to eliminate the wage gap between the back of the house and the front of the house and solve for some problems that happen inside of restaurants that we thought we could fix by removing tips,” Tarlow tells Here & Now‘s Jeremy Hobson. While Tarlow moved the restaurants back to a tipping model earlier this week, citing cost issues, he still believes a gratuity-free model is best — but customers are not quite ready for it. “[In an] ideal system, it would be like every other business, where the leadership and/or boss defines the rates of pay for all their staff and they can give raises to their staff, and not hope that people can make more money by working a Saturday night or working a Friday night versus working a Monday lunch,” he says. “Culturally, it doesn’t technically work at this moment. “I mean, there was a [mix of reactions]. No one really likes to have their pay changed. I think it’s definitely a struggle. But in the end, I think it did work out from a staffing standpoint for us. “In the end, we really couldn’t raise the prices to the full value that we needed to to pay for all of our staff and pay for the quality of food that we purchase. And so it created whole new financial problems for us, because at the table, people make micro-decisions about what they buy based on price. “Everyone again is a little apprehensive, because change always is a little shaky. As you know, we were an oddity in the marketplace. Ninety-nine-point-nine percent of all restaurants operate this way. So it’s really kind of going back to the way we used to do business and the way most people do business. “Hundred percent. I believe it should be one fair wage, and it should be the standard minimum wage for whatever state they operate in. Julia Corcoran produced and edited this interview for broadcast. Jackson Cote adapted it for the web.